"Aahh, finally arrived !, sighs the major Cahouette. Now it's time to explore this planet..."
So good to « keep our eyes on the stars, and our feet on the ground »... 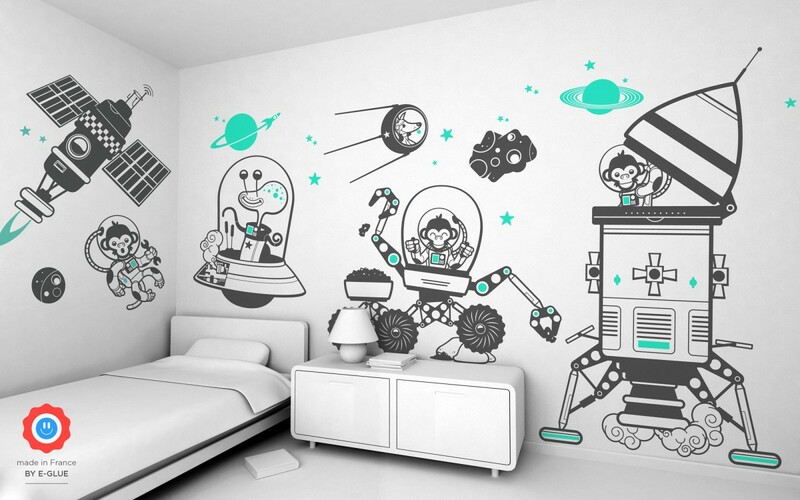 Easily create a unique Space themed bedroom or nursery, with some E-Glue giant wall stickers. This Outer Space theme decor pack contains different kids wall decals : stars, rocket, satellite, planets, enough to make an original and unforgettable wall decor for all little cosmonauts ! For example, see below a wall decal Satellite (grey and mint) applied on a light grey wall.